It’s finals season, folks. That means I’ve had no time to do much of anything except study…and that means I can’t bring you a new chapter of Legal Fiction for April. But fear not, I’ll be bringing you a two-for-one special of Legal Fiction next month. And the horn honking? Yea, I never understood the psychology behind that. Few indeed are the instances where honking is ever going to be useful. Guess people just feel the need to tell the world how they’re feeling. Yes, I’m late to the party. Wood v. Milyard was handed down on April 24 but finals season is upon me and I have basically no free time. Probably only a true habeas fan like me will care about this case because it deals with the ability to waive timeliness. The holding can be reduced to this sentence: When the state intentionally and explicitly decides to waive any argument that the habeas petition must fail due to its untimeliness, a court of appeal may not raise that untimeliness sua sponte. Boring? Sure. Bland? Sure. Important? Immensely. Academics rarely focus on the filing deadline aspects of habeas / post-conviction but my experience has been that it presents the single biggest hurdle to relief for petitioners. Whatever frustration we might have with § 2254(d)(1), we need to acknowledge that § 2244 is every bit as troublesome, practically speaking. The Court’s unanimous ruling in Wood is doubtless narrow but a pleasant surprise nevertheless. See here. As someone who has been there, I can vouch for some of what the Department of Justice has said about the Orleans Parish Prison. I remember Marlin Gusman giving some of us from Orleans Public Defenders a tour at some point in 2008 and being worried. We heard from clients that these sorts of things were going on and it’s nice to have the federal government confirm. All I can say is that it’s about time. Let’s hope that a settlement produces a consent decree…or that the U.S. Attorney brings suit. Kenneth Jost, who authors the blog “Jost On Justice,” has a piece entitled In Trayvon’s Memory, Repeal ‘Stand Your Ground’ Laws. It is a piece that terrifies me. Note upfront: I’m NOT taking any position on whether Zimmerman has an affirmative defense in the shooting death of Trayvon. I am taking a position on how little Jost seems to know about the criminal justice system and about making persuasive arguments. First, he opens with references to states that have reacted to “senseless crime[s]” by enacting legislation that is a “lasting legacy to an innocent victim.” This doesn’t have too much to do with the nature of the criminal justice system but I still feel inclined to comment on it. I don’t this find appeal sympathetic or persuasive. Why would a victim need a lasting legacy? In an attempt to right a wrong, you say? But how does legislation do that? The wrong is already done and any restitution that is necessary comes from the prosecution of an individual defendant. Criminal law is at its best when it focuses on making society safer by deterring and rehabilitating. To the extent that legislation might accomplish such a goal then I am not facially opposed to it. Enacting legislation just for the sake of reminding us that someone wronged another at some point seems pretty senseless without any other motivation. Let’s start with his proclamation that Trayvon was an innocent victim. How does Jost know? I’m 99.99% sure he wasn’t there as a witness so I guess…maybe…no. I’ve got nothing. He’s just relying on whatever the media or the prosecution has put out. I’d give him a pass if the case had already been tried and he had been a juror or heard the testimony presented. Yet, we really know next to nothing. We don’t even have a proper “he said/she said” here. Bottom line: Jost has jumped to a rush judgment about whether Zimmerman has a proper affirmative defense. You’d expect someone with an A.B. from Harvard and J.D. from Georgetown to be a little better at critical thinking and open-mindedness. If a party to a lawsuit writes something in a complaint or indictment, it is naught but a claim/contention. Its veracity has to be tested in court before we know if its true under the law. It seems a bit foolish to use one party’s mere contentions as the backbone of the assumption that this was clearly a senseless killing. Third, Jost goes on to suggest that legislatures should rewrite their self-defense laws so that “Trayvon Martin . . . [didn’t] die in vain.” See my comments about how Jost rushes to judgment here without any real evidence regarding the propriety of a self-defense claim. We simply don’t know yet if there was any reason to shoot; any justification. There’s not enough evidence and certainly nothing that’s been tested by the rigors of a court operating under evidence law. Crucify Zimmerman in the court of public opinion all you want but don’t recruit legislatures to make more victims rights legislation before we even have a legal determination on whether there’s a victim in this case. Fourth, Jost spends a few paragraphs saying actually very little about “Stand Your Ground” laws. He ultimately makes the incredibly persuasive observation that “Florida’s law may or may not prove determinative in the case . . . .” Well, gee thanks for this insight. Sarcasm aside, he’s entirely right to point out that the “Stand Your Ground” laws may actually have no real place in this case at all. Indeed, David Kopel has a lengthy post explaining why here. In light of that fact, doesn’t it seem a bit premature to start suggesting legislation in Trayvon’s honor that repeals “Stand Your Ground” when it’s not even apparent that the “Stand Your Ground” law is to blame? Fifth, Jost has it that the case is in the good hands of the special prosecutor and praises the indictment as “a succinct statement of the evidence supporting the charge . . . .” Really? Have you read the thing? Seems pretty thin to me. And it turns out others in the blawgosphere seem to agree. Scott Greenfield, the author of Simple Justice, points out several attorneys who have ranged from calling the doc “stunningly weak” to a “piece of crap.” Glad to see I’m not the only one thinking that. Sixth, Jost wants you to know that “Stand Your Ground” laws have made the public streets more dangerous. Of course, like most of the other things he’s said, he doesn’t really have any first-hand knowledge of this. Rather, he relies on what “law enforcement officials” have claimed. Very persuasive (sarcasm added). Who are these cats? A few officials or a bunch? How do they know this? Is it just from what they’ve seen on the streets? Give me some statistics and methodology of how the regressions were performed. Give me an F score or an R-squared. Or a chi-squared. Give me something more, man! Telling me that some cops have anecdotally found the law makes us less safe is laughable. The Bottom Line: I’ve never hid the fact that I am pro-defense. I’m nothing if not dedicated to a fair defense. That means I defend you if you’re Black. That means I defend you if you’re White. I don’t rush to judgment; I question everything. And today, I question how much Kenneth Jost actually knows or how carefully he actually thinks. When I was an undergrad at UofC, I learned a valuable lesson: the things we believe most are the ones we need to question the most. This is a lesson Jost still needs to learn. First of all, let this post show that I’m not a coffee snob to those who have so labeled me. Do I like direct trade? Of course. Do I think Stumptown and Intelligentsia are putting out some of the best coffee on this planet? You betcha. But will I buy super cheap, bad tasting Dunkin Donuts? I will. I will because I have run out of whole bean coffee…and also because I wanted some donuts. Ok, maybe I am a coffee snob. But that’s not how a legal mind reads this. Indeed, this sign has all sorts of ‘fun’ textual interpretation issues associated with it. 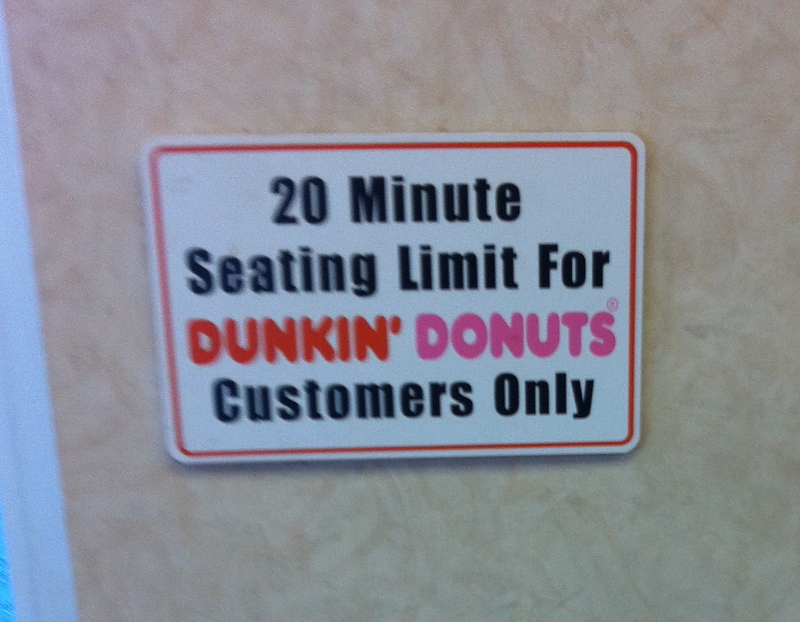 For example, this sign could actually be read to mean that the 20 minute limit applies only to Dunkin Donuts customers. Be careful, it might seem like this necessarily implies that non-customers may sit for as long as they like. It doesn’t…though it does necessarily imply that the 20 minute limit doesn’t apply to non-customers. Perhaps non-customers are subject to some other limit or an all-out ban on sitting? We don’t know. And of course, I’m making a lot of assumptions about how terms are defined in this photo. What constitutes a “seating limit”? After 20 minutes have elapsed, may a customer stand up and then sit right back down to re-start the time limit? Must a customer leave the store or does this limit just mean that customers have stay standing up if you want to remain? Bottom line: you can find ambiguity in almost any text if you try hard enough. Let Dunkin Donuts be a lesson of this. I’ve been wanting to write a post about this subject for a while now and it hasn’t happened. Yet, the news has continued to provide prime examples in the past few months and years of a natural tendency: our tendency to presume guilt instead of innocence. A few quick examples: the Casey Anthony trial, the Treyvon Martin shooting, the Michael Jackson cases. In the near future, I plan to put that fancy psychology degree I have to use and talk about something other than just law…gasp! I know, I know…it’s been too long since I did that. Well now’s the time for answers. In the face of a legal system that requires us to presume defendants are innocent, our natural reaction is to make snap judgments of guilt. Why is this? What about our psychological underpinnings drives the phenomenon? Is it just a classic case of heuristics, confirmation bias, and the like…or is there more going on here?